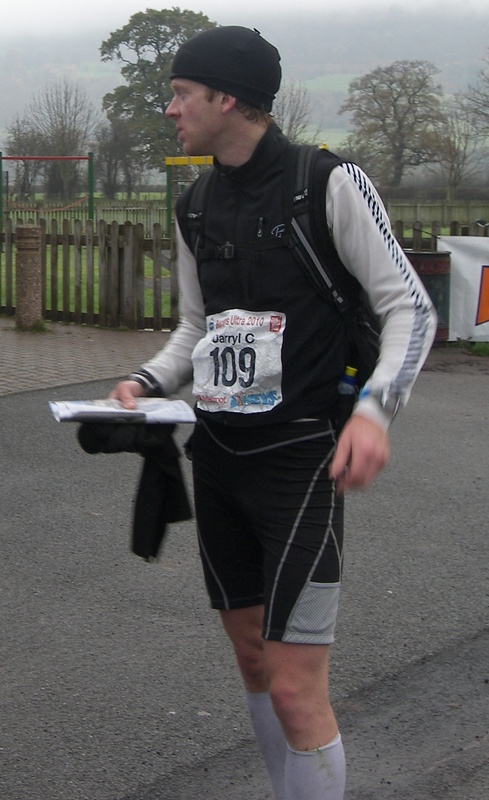 This was my first competitive off-road ultra race and although I hadn’t done the kind of distances in training I thought were necessary, I’d spent a bit of time researching and preparing myself. In last years event over the same course the winner (Mark Palmer) finished in 6hrs48mins with splits of 3:20 and 3:28 for both laps. This equates to 8:50-8:55/M pace. 2nd and 3rd finished around 7hrs20-30mins overall on 9:50/M. That doesn’t sound fast, but having done an 11mile recce of half a loop I knew it was going to be a lot more challenging than your average road race, with the rough stony ground, two mountains and plenty of fields, gates and stiles to negotiate over two laps. Having checked out the history of these runners on ‘Power of 10’ I knew they were not only quick over distance but also probably more experienced in ultra trail running. I was excited though and I won’t lie….I wanted to go for the win. So I was focused on 8:50/M average or better over the distance. As this was new territory for me I was prepared for the inevitable struggle once I went over 22-26miles and Plan B was always to pull out at halfway (23miles) if too much damage was being done. I didn’t want to ruin 2-3 weeks of training for the Double Ironman. I’d met up with an elite ultra running friend, Jo Kilkenny, for another run around our local park in the week prior to the event. I was keen to pick her brains on a few issues and let her check out my equipment for the race. Everything was fine regarding clothing and general equipment although I still had to decide whether or not to carry a full bladder (2ltrs) of liquid from the start or run with a bottle and top up at the checkpoints. There were 5 checkpoints/water stops in the race – 7M, 16M, 23M(end/start lap), 29M, 39M so ideally a 750ml would be required (although on the day most were using 1-2 x 500ml bottles). A 2ltr bladder would mean you could get away with just topping up at checkpoint3 (end lap1) but you’d be carrying around an extra 2kg up and down the hills/mountains. In the end I DID go for the bladder option but filled it to 1.5ltr and decided to take a 500ml running bottle and fill it at checkpoint2 onwards. In hindsight this was a mistake. It only meant skipping the first aid station and I had to carry the weight up the steep climb of Tor-y-foel. Next time I’d take a 750ml bottle and try to have it accessible from the front – inov8 do a good bottle holder for this purpose. Nutrition: I also decided to carry 3 x 140ml bottles of concentrated carb gel – 1300cals in total. With the 1.5ltr of electrolyte (400cals), 1300cals gels and a protein bar I had enough to get through the race on 250-300cals/hr (based on a 6hr45 finishing time). 300cals/hr was the golden figure. I wouldn’t eat more than this unless I really had to. I had a spare energy bar (200cals) and packet of peanuts (400cals) should I slow down and/or get desperate. I stayed at my folks in Tenbury Wells from Thurs evening, which was just 1hr from the race venue at Talybont-on-Usk. A 7am registration meant I was up at 4:30am sorting myself out and getting myself well fed and hydrated. A simple 300cal med-GI breakfast, followed up with half a banana and gel from 6:30am. The weather wasn’t too bad, plenty of mist and around 6c. I’m certainly glad the event wasn’t held a week later as the wind had just started coming from the NE prior to the end Nov cold snap. At the start line and race brief I had a chat with a friend Alexia. Around 120 people were lined up with all manner of equipment. From the off I deliberately started in around 10th place because I wanted to relax into it and make the first 3miles along the canal feel as if they never took place. There wasn’t much to see for the first three miles but I was shocked at the pace the front runners were keeping. I tried to stay with them and a group of six formed, with me at the back. The first few splits showed 7:15-7:40/M although it felt quicker. The extra (liquid) weight on my back probably didn’t help although I’d been working on my weight over the previous 6 weeks and rocked-up at 70kg (2.5kg loss). The fourth mile took us over the canal up a short steep climb, into the trees and then out into the fields. The grass underfoot and negotiating of stiles slowed the pace down and we were gradually building up to the Tor-y-foel climb, the first of the two major hills on the 23mile loop. It was on these fields that I had my first accident. Leaping over a stile I didn’t quite make proper contact with the step and slipped forward, tumbling over the two steps and on to the grass. I cursed myself for the mistake and hoped I hadn’t injured myself in the process. One of the competitors in front stopped to check I was ok. No harm done except a little sheet poo on garmin/roadID/white HH top – triple damn! As the incline increased and we passed through a few more gates and stiles to the steep section of the climb the group exploded. I’d already noticed who I thought must have been the winner from last year (Mark Palmer) going off the front at this point. It was becoming quite tough as we entered the mist with the incline getting steeper and steeper to the point that most of us were using various forms of shuffle/walks. All except for one person of course! I didn’t want him to get away because a) I wasn’t as familiar with this first half of loop and visibility from mist was down to 30m, and b) I wanted to see how he handled the terrain and maybe put a little pressure on him later in the race. He was disappearing and I tried really hard to keep a light run going in zigzags up the climb mixed with a few strides while pushing my quads down with my hands to aid leverage. It was killing me, my quads were screaming. At the top of Tor-y-foel was a little orange tent and a marshal sitting inside taking numbers. He looked quite comfortable despite the oppressive weather. I ran straight past and on to the steep descent down the other side. Immediately I could hardly feel my numb quads and wondered whether I’d blown my race already, but sometimes you have to push that little bit harder to stay in the race dynamic. At this point I was alone – MP at the front and third place behind were hidden by mist. I took the more direct and wider path over the hill but I’d passed a path that branched off slightly to the right which seemed like a more western direction. I thought nothing of it at first but having checked my Garmin mapper it looked like I was heading a little to SW compared to the dotted line of the laminated race map. I started asking myself questions, slowed down to a walk and thought about waiting for third to show up through the mist behind to confirm I was still on the right route. After 30secs – nothing. Rather than wait any longer I decide to take a chance and not waste any more time. It was only a mile from the first official checkpoint at the bottom of the hill so I picked up the pace and let gravity carry me down the hill. I loved fell running down hills at speed. It seems so easy in training but over longer distances I was aware how much damage you can do. In hindsight I would have found another line/path down the hill. I kept to the main paths, which involved a lot more rock and stone dodging. At the bottom and SW side of Tor-y-foel the course meets a road/track on the Beacons Way where a few marshals were waiting to take race numbers. A further 1 mile along the road was checkpoint1 and the first opportunity to take water. Of course I could run straight past on this occasion but I asked what the gap was between me and the leader and was told about 3-4 minutes. I was surprised at the time he’d built up already. I know I paused a couple of times in the mist, but he’d obviously made an enormous amount of time running down the other side of the hill. The 800m following the checkpoint was down a rocky, wet trail to another track road. It was on this trail that I had the first of my trips (I counted 9 trips and 3 ankle twists in total for the race! ), thankfully managing to bring the other foot forward in time to stop me pitching head-first into the stones. Halfway down the track rainwater had gathered into a pool over grass and stones, which was a little difficult to negotiate, especially at speed. The bottom of the descent opened out on to a 4mile piece of track road through the woods alongside Glyn Collwyn and with a slight incline. I was finally able to get my pace back to around 7:45/M here. I couldn’t see MP ahead of me, but I did notice a guy just 400m behind at one point in a yellow top. I presumed he was in the race. This was the last time I saw anyone behind me for the rest of the race. On exiting the woods over a cattle grid the track joined-up to a road and the Taff Trail. After passing a few marshals, spectators I was shocked to see MP just 50m ahead of me. I presumed he’d taken a break. This was the perfect opportunity for me to pace to him. I’m not sure exactly what happened for the next mile though, that was at first uphill, and then a steep descent, but I let him get away. It wasn’t until the start of the long climb to the ‘Gap’ near Fan-y-gig that I spotted him. He was emerging from a small but deep ravine and just 1:25 ahead. I took the opportunity to take a toilet break, snack and drink knowing I’d be able to pace back up to him on the steady but stony ascent. Unfortunately I’d miscalculated. Having walked out of the ravine he looked to be a good 2-3mins ahead, and flying! By the time I reached the mist at the top of the climb he was out of vision. The four mile run to the top negotiating the stony path had taken a lot out of my ankles and feet and I was glad to ease off over the start of the descent. 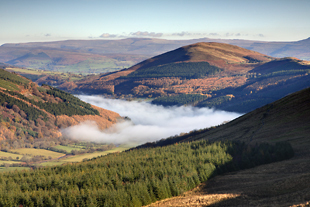 The views along the valley, just like Tor-y-Foel earlier were fantastic and added to the race. Miles 16 and 17 of the loop were down the back of the mountain pass and over rocky and steeper ground. In my recce a few weeks back I’d enjoyed the thrill of flying down the trail skipping of rocks. At this point though I was starting to get sloppy and tripped a few more times. The wind was lightly blowing the mist against my face and into my eyes so I rubbed them without thinking about my contact lenses. The right lens slipped around the eye ball and I couldn’t encourage it back again. This was frustrating and also made the downhill run a little more precarious as I now had a kind of tunnel-vision thing going, with one eye clearer than the other. I eased a little on the pace until I found some grass to the side of the track, and picked it up again. At the caravan at checkpoint2 they offered me the use of the mirror in their toilet. This was very generous of them, particularly as I must have left dirt all over the carpet. 2-3mins lost but I was glad to be able to see properly again, and just told myself that If there was ever going to be a stop in the race….I’d just had it! It was also at this point that I switched to my hand-held 500ml sports bottle. It was filled with water and I added a nuun (salts) tablet. I would refill at each checkpoint from now on and use it to help wash down the carb gels. In practise I’d found it could hang nicely from the (front) belts of my backpack, but in the race it became a little annoying having it bouncing around. So at first I ran with it in-hand or tucked it into the top of my shorts, and later I’d have it in the side pocket of the backpack which I accessed on steep climb walks. At this point I also started taking painkillers. Painkillers: I carried 8 x acetaminophen (non aspirin). I’d done a bit of research and these seem to be the painkiller of choice for ultra runners (should they be required). They do not dehydrate and put adverse stress on the liver and kidneys (I’d read some horror stories on this!). There were a couple of ibuprofen in there too though, which I also took. Miles 17-23 were the most interesting of the race if not the most picturesque. It started with a 400m trench of stones! I had a nightmare trying to get through this section at any kind of speed without twisting an ankle or tripping (which I did on both counts). I’d learned after the race that some more informed people were running in the fields on the other side of the trench. I wasn’t aware this was accessible and it would have saved the legs if not a few more minutes. After the trench the route passes through Llwyncelyn, Llanfrynach and Pencelli over fields, through stiles and gates, around a river and finally the 2miles along the canal to take you to the end of the loop (@ checkpoint3). I’d run 3:14 for the first lap. This was 6mins quicker than the fastest lap of last year. But MP had gone better with 3:07. There were four guys behind me coming in at 3:19-3:21 so I had a 6-7min gap either way. The graph below shows a comparison of mile splits for the two loops. The blue line shows lap1, the red lap2. 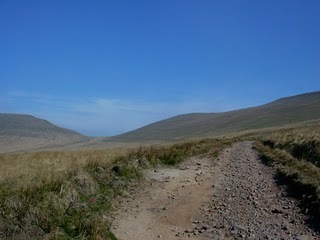 For some reason the Garmin GPS watch stopped at the start of the second climb to Tor-y-foel. I noticed this and started it again but missed 1.5miles. Generally the second loop splits were around 30secs/mile slower than the first. A few exceptions were the run down from the ‘Gap’ to checkpoint2/5 where I’d misplaced my contact lens on the first loop, and the final road-canal section. I had a reasonable run along the canal at the start of the second loop. I was concentrating on keeping good running form and finding ways of mentally getting through the bad patches without walking. I’d already tried mumbling songs to myself but I kept finding ‘She Said’ by Plan-B intruding, so I gave up on that. I tried a Paula Radcliffe method of killing time – counting steps. I’d count 2 x 100 on each foot fall and found this helped clear my mind. I kept doing this every time I felt like stopping and the moment would pass. Running technique/gait: In the weeks prior to the race I’d spent a little time in the gym on a Power-Plate, gauging which positions carried more/less vibrations up through the legs. I’d already been working on planting the foot a little further back while running, increasing foot turnover and landing more on the midfoot(forward). I kept thinking ‘run on eggshells’ to limit impact. On the second climb up Tor-y-foel I managed to keep up a similar pace using a walk/run. I couldn’t see anyone in the valley below me and MP was probably 15mins ahead. I made an error halfway up when I went through the wrong gate. Of all the places on the course that needed an arrow this was it. I kept an eye on my Garmin map for the first 50m and noticed the change of course to the first lap, so doubled back and took the correct gate. The rest of the second lap was similar to the first albeit slightly slower. I found the long run up to The Gap a lot harder the second time around and tripped a few more times. I was tentative at the start of the descent over the top and made sure I climbed to the left on to flat grass as soon as possible near the bottom. At the final Checkpoint I topped up with water, thanked the marshals for their help, and now knew I just had 6-7miles to go over what would be a faster section of the loop. On the final bridge to the start of the canal section I tripped for the ninth time and this time I didn’t have the strength to bring the recovering foot forward in time. I pitched forward and to the left into the grass. I was lucky. If I’d pitched to the right I’d have been in the canal. With just 2-3miles to go I felt good. The painkillers may have helped but I’d balanced my nutrition and paced myself perfectly. I picked the pace up at times to test my speed and it felt like the end of an Ironman event. On the approach to Talybont I realised I’d be finishing outside the hall and enjoyed the final 200m to the finish in front of my folks. It was great to finally meet Martin and Sue Like who did an awesome job of organising the event along with the other marshals. I hung around for a few hours to see some more finishers come through and have a chat before the medal ceremony. 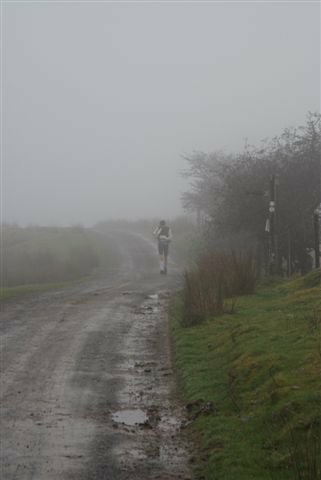 I then drove up the road to Llanfrynach to see the runners coming down the dark misty hills with their head torches on and give Alexia a shout. She did really well finishing 4mins off 10th female. I was pleased with my performance. There were a few small errors and bad luck but generally I can’t complain and I’m keen to go back in 2011 and take a chunk out of my time. I should be able to squeeze in some of the course over xmas, hopefully involving some snow or night running (or both). I thought ultra running might be a proper spin-off for me in the future when I move on from Ironman, and if this race is anything to go by, I’m really looking forward to it! It’s been 10 days since the event as I type this. It’s certainly taken longer to physically recover than any previous marathon or Ironman. I normally get back into training in the week following a race and feel fine the week after that. I was fine the evening after the race, but from Tuesday to Friday I had trouble walking let alone running. The ankles had seized up and the quads in particular were sore. I’m now still aware of (achilles tendonitis) pains in the ankles and my quads are not firing off as they should be but I still squeezed 11hrs training in the week (around a lot of alcohol), and I’m looking for 15-18hrs this week. Inspiring stuff, I know from experience that my legs and hips get long term damage above 30 miles running. You go for 47 over mountains, then train soon after ! Looking good for the double IM in Feb.
Great result, good job you didn’t end up in the canal though; that would have been an unpleasant last few miles in to the finish! I’m doing my first 50 miler next year, so found your data on nutition very interesting. Where did you find acetaminophen? I think it’s marketed as Tylenol in the US. Hi Martin, which race are you planning on doing? In for the Caesar Endurance Camp 50 in October 2011 but have a marathon, an Iron Distance weekend and maybe IM Wales in the works. 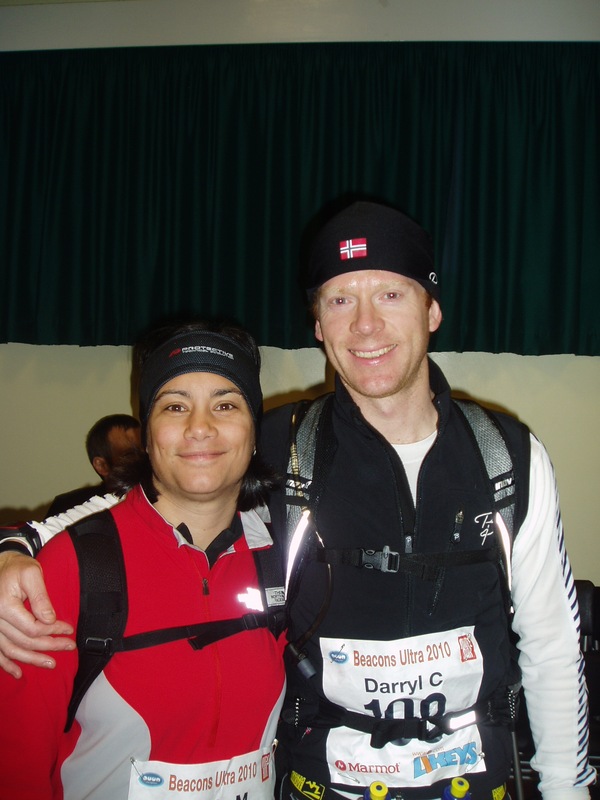 Congratulations on your performance at the Beacons Ultra, having done it, and finishing last ! (no shame I was chuffed to finish!) I am incredibly impressed by your obvious talent and commitment to your sport. Your account of the race is excellent and it is interesting to compare the race through the eyes of an elite athlete. For my part, I loved it.It was special to, (I Use the word lightly )’Compete’ with such a talented bunch of individuals. For my part, I did the race to test my metal and get fit for my deployment to Afghan next year. Although I will be facing a very different challenge this time next year I aim to be back and giving it a go in 2012. I have competed in many races, but I hope you agree that the Beacons Ultra ranks amongst the best around? Very well done and all the best for your forthcoming events. Thanks Darren. I really enjoyed the event too and I’m keen to do the race again next year. It certainly falls at the perfect time of year to get a good quality field together. Need to check more of these races out – will have a look at the Afghan – I’m presuming its a monster of a race! ?